The Fujifilm FinePix S8500 is an ultra-zoom digital compact camera with a huge 46x optical zoom lens that starts from 24mm and reaches 1104mm at maximum telephoto. It also has a 16 megapixel back-illuminated sensor, Full 1080p HD video at 60fps, a 1cm super macro mode, continuous shooting speed of 10fps at full resolution, an electronic viewfinder, easy upload options for sharing your photography and videos, and is powered by readily available AA sized batteries. 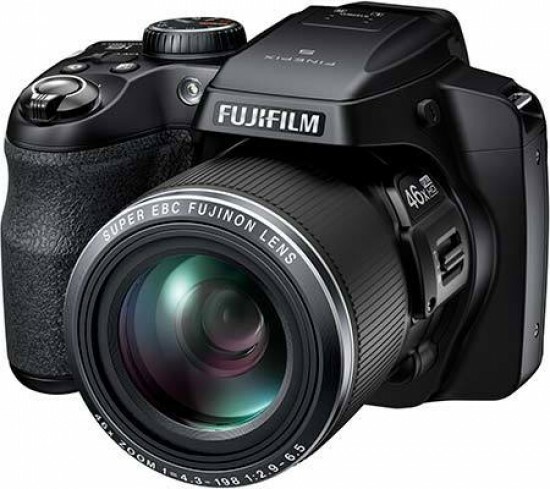 Priced at just under £200 in the UK, the Fujifilm FinePix S8500 is available in black only. There used to be a fine line between a bridge camera and a superzoom. It used to be the difference between having manual controls and being fully automatic. If it had manual controls, then other features such as a viewfinder and raw recording were automatically included in the feature-set. These days, that line is getting smudged and as newer cameras are released, they offer combinations of those features. On a bridge camera, we'd expect to see manual control, raw recording, an electronic viewfinder, metal tripod bush and either a manual zoom ring or a zoom switch on the lens barrel. The Fujifilm FinePix S8500 has some of these features, but not all. You can select manual controls, such as aperture priority, shutter priority and manual. It has an electronic viewfinder, for using the camera at telephoto settings (or if you just like to shoot that way), but only a plastic tripod bush. That's an unusual feature for a camera with such a large zoom. Still the 16 megapixel sensor is back-illuminated for increased performance in low light. There is a zoom switch on the side of the lens which is great for holding the camera steady while still tracking a moving object with the zoom. It's a mixed bag with the Fujifilm FinePix S8500. However, it's not the first camera to do this. In fact, it's simply following a trend of recent bridge cameras and superzooms that have had the dividing lines smudged. The command dial on the top plate is large and chunky and has other features than the previously mentioned manual controls. You can choose from the Panorama mode, SP (Scene Position), Adv. (Advanced settings such as HDR, Low Noise and High Resolution), Auto and SR Auto. The latter mode being the “do everything for you” auto. Alongside the command dial, Fujifilm have fitted the FinePix S8500 with a sliding power switch. This prevents accidental powering on of the camera and will therefore protect the lens and battery power. Just infront of that are the exposure compensation and burst mode buttons. Teetering on the edge of the chunky grip is the shutter release button with a large, secondary zoom ring surrounding it. On the back, the Fujifilm FinePix S8500 has been provided with an Electronic Viewfinder (EVF) which sits at the top, directly behind the pop-up flash. The large screen occupies the Lion's share of the back although there's still plenty of space for the buttons which are located to the right of the screen. There's a direct record button for shooting video on the fly and the S8500 is capable of FullHD video recording. Directly beneath that is the Playback button for looking at photos and video that you've already shot. The navigation pad is in fact a wheel. It can be pressed left, right, up and down, but the ribbed wheel can be turned for faster navigation of menu systems. In the centre is the access button to the Main menu. On the bottom, you'll find the battery and memory card slots. The Fujifilm FinePix S8500 takes AA batteries and in the past there's been some argument over whether these are a good idea, given the power consumption of digital cameras. Those issues have been addressed these days with both higher capacity batteries being made available and cameras becoming more fuel efficient. It means that if you're out and about and your batteries do fail on you, it's possible to pick up some spares from pretty much any tourist shop or supermarket. The S8500 accepts Secure Digital (SD) memory cards and is compatible with SDXC. These are the ultra high capacity cards that have a theoretical limit of 2 terabytes (2048Gb). The Fujifilm FinePix S8500 only has one Main menu which is accessed via the button we mentioned before in the centre of the navigation pad on the back of the camera. The menu is split into two sections for shooting and set-up. In the Shooting menu, you can select options such as ISO, white-balance, resolution, compression and AF options as well as metering, video and flash modes. Press left to navigate down to the Set-up menu tab and here you'll be able to change more in-depth features such as the date & time, language of the camera, sound controls, you can reset the camera and format the memory card. Additions will appear to the menu system depending on what mode you're in. For example, if you're in Advanced Filter mode, an extra option will appear in the Shooting menu to change the filter. This can be a little confusing to work out at first, but once it's been a couple of times, it's easy to get used to. Start up time from cold is around 1.8sec which is great considering that it's a sliding power switch as they're – in our experience – slower to react. It seems that the average start up time of 2.5sec is changing these days and is coming down under the 2sec mark. There are seven continuous shooting modes on the Fujifilm FinePix S8500. That list includes a Best Frame Capture mode and AE Bracket. We kept getting a slight delay from pressing the shutter release to the pictures actually being taken of around 0.145sec. There could also be some reflexes to take int consideration. The camera was pre-focused. SH1 (Super High mode, option 1) captures around 60fps (frames per second) at video size which is around 2 megapixels. It stops just after that to download which can take some time. SH2 records at 640x480 (around 307,000 pixels) and again takes 60 frames. The only real advantage we can see for dropping the resolution is to have a faster download time. It cuts off around five seconds in total. There are three continuous modes as well, named Low, Medium and High. Low mode takes around 16 frames in a ten second period at full photographic resolution. It shoots a burst of four frames in the first second then starts to slow down until by five seconds, it's only taking around one frame per second. Medium gets a little faster taking five shots in the first second, but also slowing down and it ends up taking one extra shot in the ten second time period. High mode shoots at 9fps and also then slows down. We got 18 shots in ten seconds. The time it takes to load this information onto the memory card takes longer. We used Class 10 SDHC cards and it took just under 30sec to download each burst test. 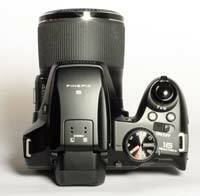 The Playback mode of the Fujifilm FinePix S8500 is accessed by pressing the arrow button non the back of the camera. The most recent photo you took will be displayed on the screen with some basic shooting information. You can change the amount of information displayed by pressing the DISP button at the bottom of the camera. We favour the Histogram option which shows all shooting information with a small thumbnail of the photograph and a histogram underneath. You can also have basic info or none at all. In the Playback menu you can edit pictures by removing red-eye, cropping and rotating them. You can mark images for upload to social media including popular sites such as Facebook and YouTube as well as Fujifilm's own social network MyFinePix.com. In the box, you get the camera, a set of AA batteries to get you started, a neck strap (let's face it a wrist strap won't do), lens cap and USB cable to download photos. You also get a warranty booklet and brief user guide. The full manual is on the enclosed CD which also has MyFinePix Studio ver4.2 for basic editing, tagging and storing of your pictures.